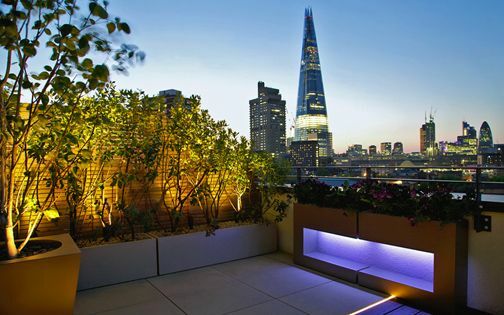 This intimate Clerkenwell rooftop design features a series of original, minimalist planters, connecting a multilevel outdoor space with its apartment's bright interior and city skyline. 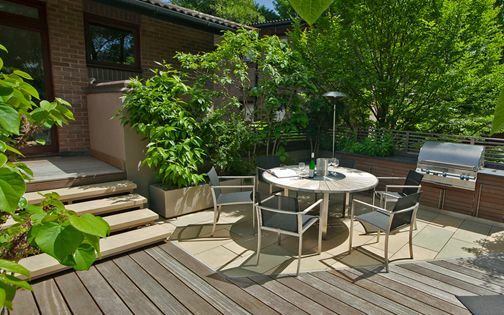 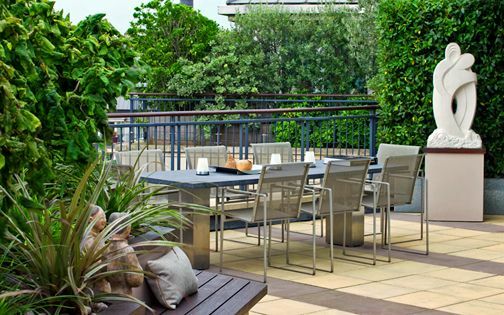 The lower shaded terrace sustains a lush landscape, enjoyed in seclusion, where a majestic St Paul's Cathedral vista is framed by a multi stem Maidenhair tree. 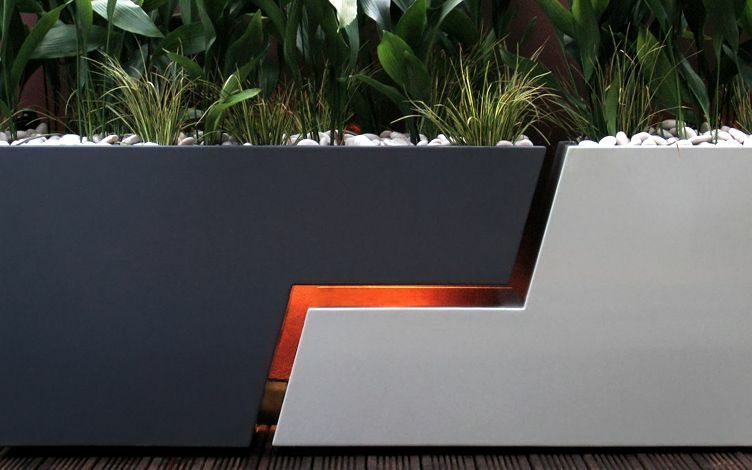 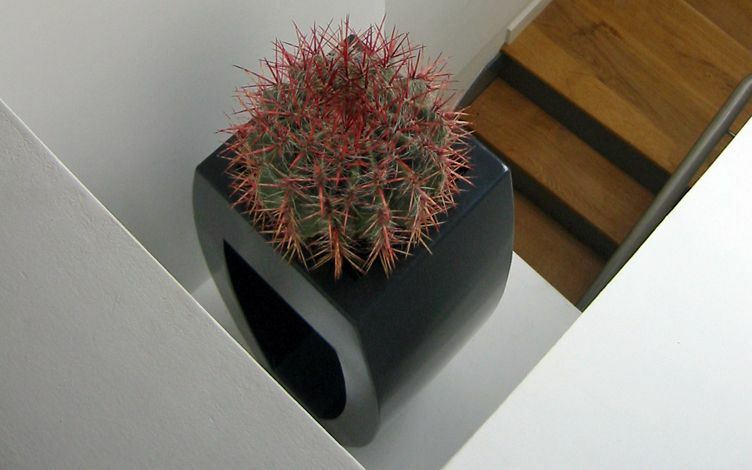 We integrated bespoke planters into an indoor art collection, enhancing clarity and fluidity. 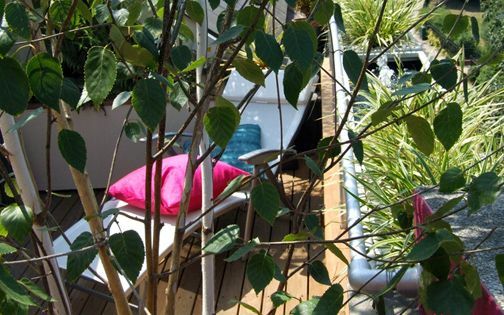 With a further roof terrace we landscaped at the penthouse's back elevation, our client enjoys an indoor-outdoor sequence abundant in detailed designs and architectural foliage. 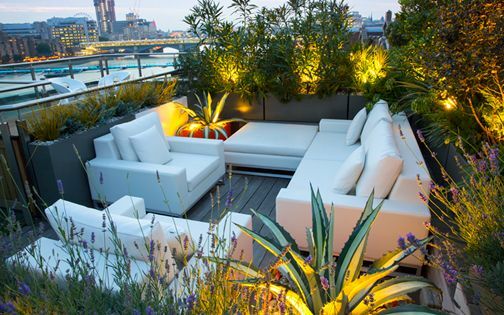 When our client received the keys to this unusual Clerkenwell penthouse apartment, his three small roof terraces contained mere decking and pots brimming with weeds. 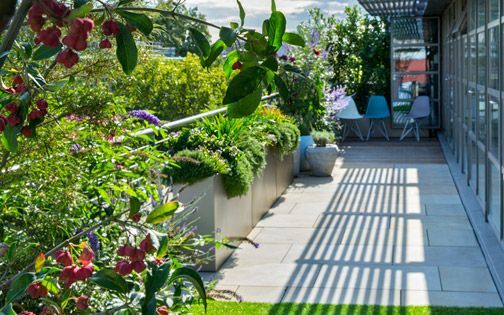 A sunny terrace adjoining the kitchen features an inspiring St Paul's Cathedral vista, while a lower rooftop terrace forms a shaded wrap-around by the master bedroom. 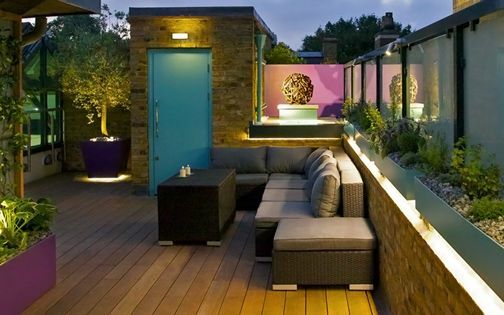 Clerkenwell's clay bricks and slate roofs backdrop was echoed within our colour palette for custom-made containers and wall elevations. 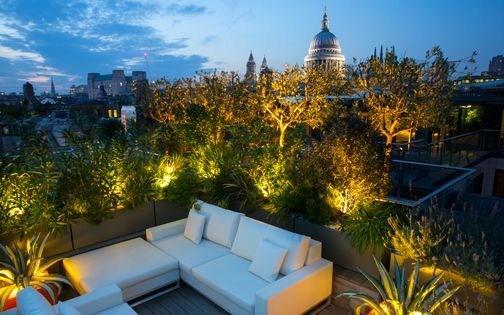 As each rooftop within the sequence presents a unique microclimate, the varied topographies enabled distinct designs for each terrace. 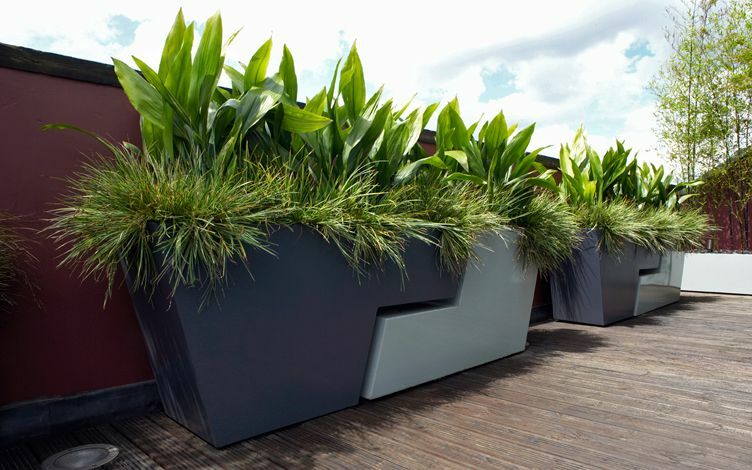 With a blank canvas, we formulated a minimalist series of indoor-outdoor planters which enhance an architectural rooftop design. 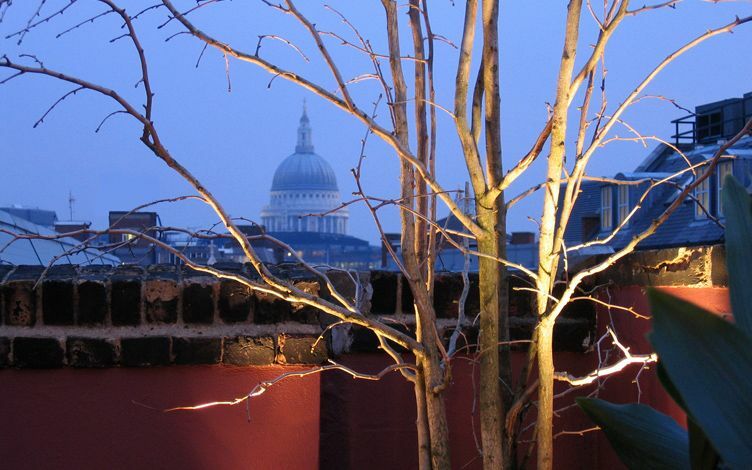 The view to St Paul's Cathedral and Barbican terraces is unveiled through the noble branches of a multi stem Ginkgo specimen, where this Maidenhair tree projects captivating silhouettes with its ancient Chinese pedigree – highly resilient in urban pollution. 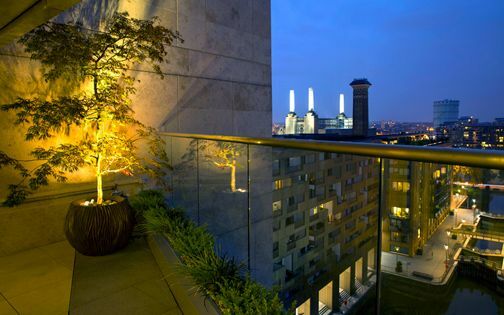 The containers' apertures increase daylight permeation, and facilitate uninterrupted panoramic views to London's city landscape, while a minimalist tier of evergreen, grass-like Carex sedges, mulched with beige pebbles, leads towards a graceful contemporary sculpture, specifically commissioned for this project. 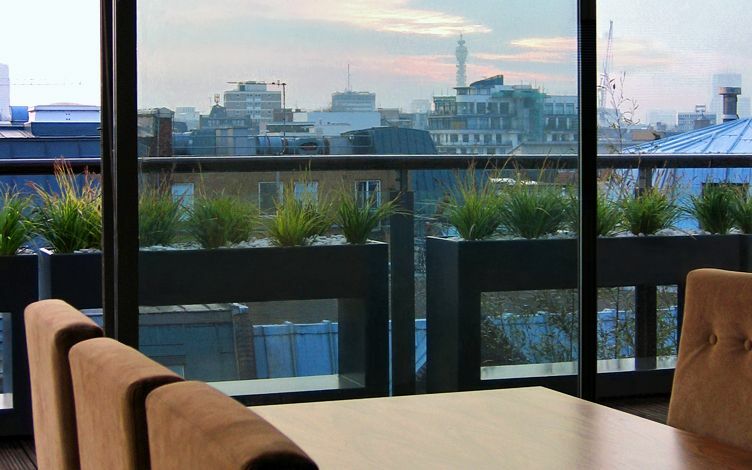 The slate-grey planters blend into their surrounding Clerkenwell and Farringdon rooftops, while the Portland stone artwork mirrors an outline of a church in its backdrop. 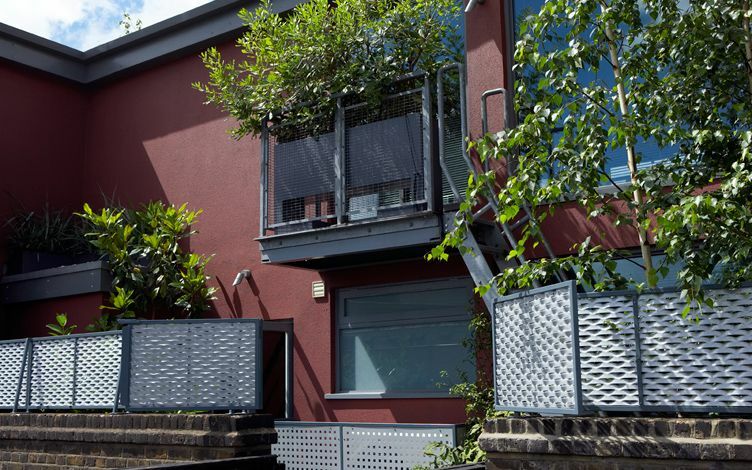 Having retained an existing decked terrace framework, we stained rooftop surfaces in a natural hue to contrast the rendered walls' new maroon colour, and echo an American Black Walnut interior. 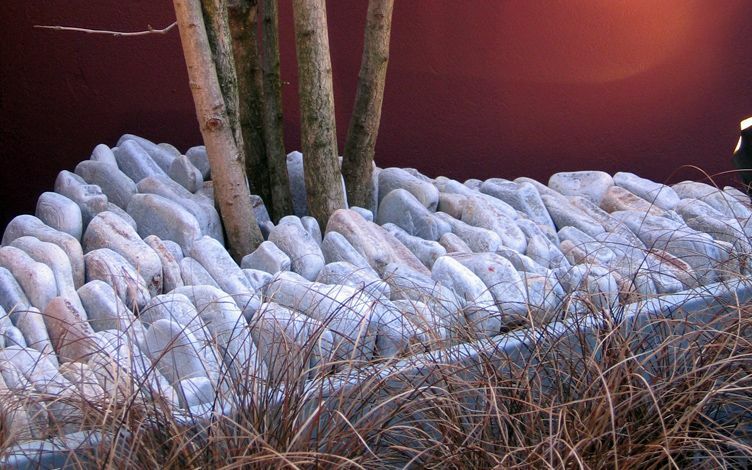 The site-specific sculpture was conceptualised in situ by stone artist Elliott Brotherton, reminiscent of St James's Church steeple in EC1's skyline. 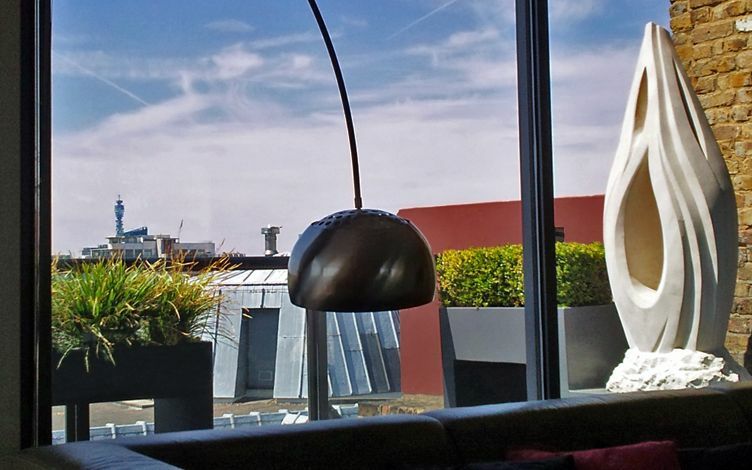 We designed a matching curved indoor vase for an entrance alcove featuring a fun Barrel cactus, and continued this fluid methodology by enhancing BT Tower's panorama with two pairs of custom roof terrace planters, defined by their spacious, luminous cavities. 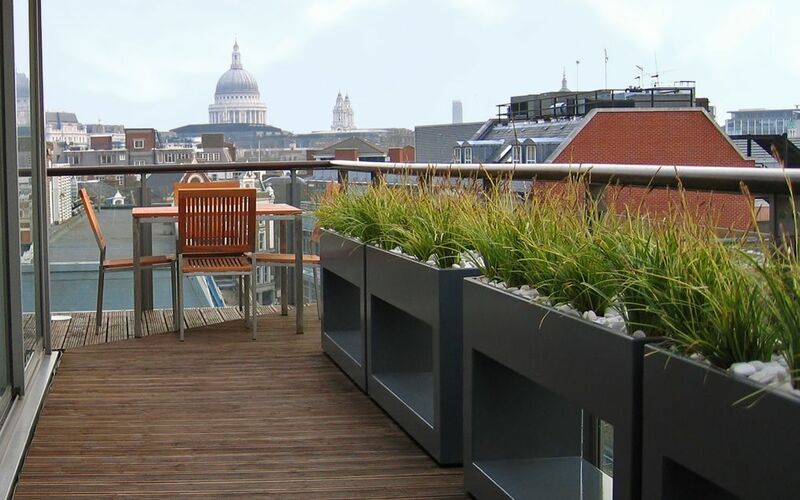 Given inherent compact rooftop walkways, the elevated planting sustains vital ergonomics with slim vessels, while integral irrigation, terrace lights and drainage outlets are discreetly concealed on the verso. 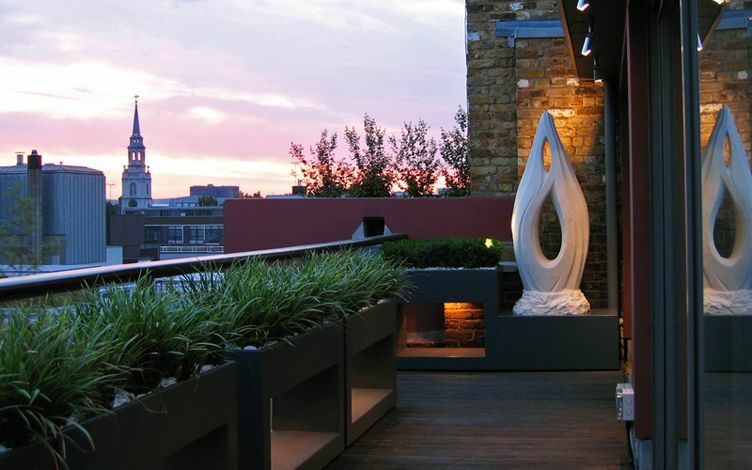 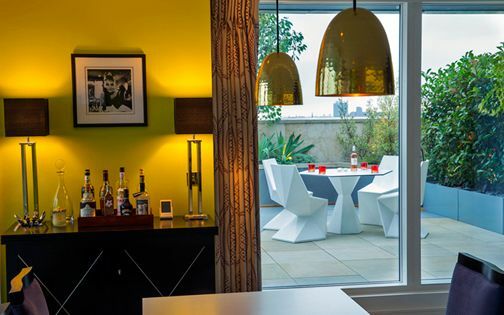 We developed a third rooftop terrace at the apartment's back section later on, as we often do for clients in surrounding areas, such as this remarkable Shoreditch penthouse terrace. 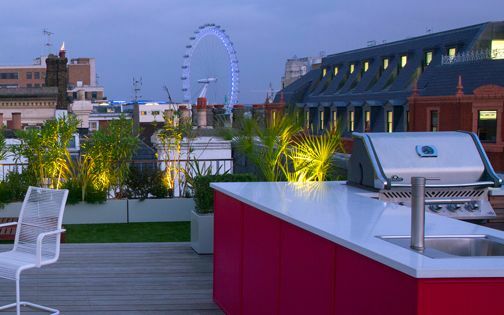 The rear rooftop is nestled over two levels, and required privacy towards offices opposite, where expanded and perforated aluminium screens were specially sliced and powder coated to match the planters' colours. 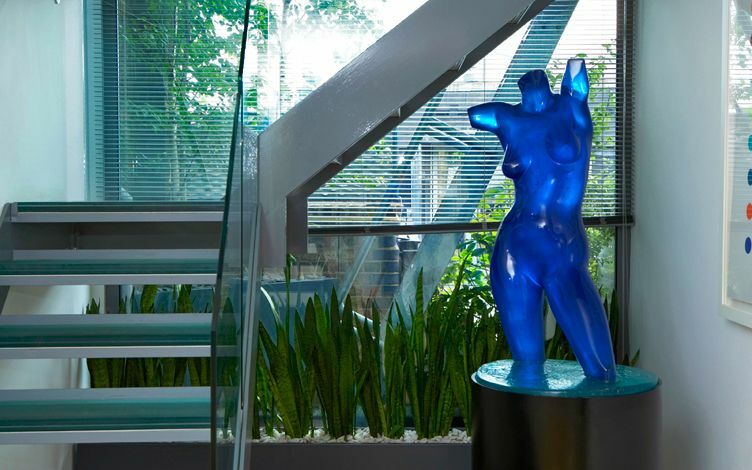 Tall Silver birch trees are viewed through full-height glazed elevations from both upstairs living rooms and lower entrance hall, while tropical indoor planting recaptures this lucent vignette to underscore an anthology of private artworks. In the culmination of this long-term rooftop design project, we imparted a streamlined contemporary outlook; the client's terrace lifestyle, art passions and affinity with minimalist gardens were fused integrally across the entire residence and its landscaped rooftop garden collection – sustaining a seamless, enduring connection.